The image is timeless, and nearly cliché at this point, but personifies cool. Marlon Brando is looking off into the distance, clad in a classic biker jacket and astride a motorcycle in the movie “The Wild One.” The bike makes the image; large and foreboding, it’s the bike of rebellion and teen spirit. That bike was a Triumph Thunderbird. We took the latest version out for a test to see what about this bike made Brando so cool. You may think you only have one or two options for a cruiser with attitude, but overlooking a Thunderbird would be a big mistake. Just like in that iconic image, the Thunderbird slinks in the background. Also black, the bike we tested always intrigued people for what it wasn’t. It fires on all the classic cruiser cues, chrome, loud, big, etc., but doesn’t have a V-twin, and emits a rumble that is different. It’s this mystery that draws people in, and is the best part of the bike. Some parts of the bike look derivative, but the details set the bike apart on its own accord instead of a copy of something else. The Thunderbird is motivated by a liquid-cooled 1597cc parallel twin motor. The motor puts out 87hp and 108 lb feet of torque, and every pony is felt even though this is a heavy bike at 746 lb, but a cruiser isn’t about numbers, it’s about the experience. Usually, when you liquid cool a motor, character is lost -- that communication through vibration and clatter goes away to the whir of cooling fans. The Thunderbird, though, retains old school charm with new school technology. The motor barks and spits upon throttling off, and pierces the air with a low frequency rumble upon acceleration, but doesn’t burn your legs with the heat of a thousand suns. The motor quantifies the perfect balance between the demands of today with the attitude of yesterday. Additionally, the bike comes with adjustable rear suspension, and disk brakes all around, but this bike was made for long, empty highway patches, not carving the corners. Plus, the brakes are exceptionally strong, although I would’ve liked for more feedback from the handle. 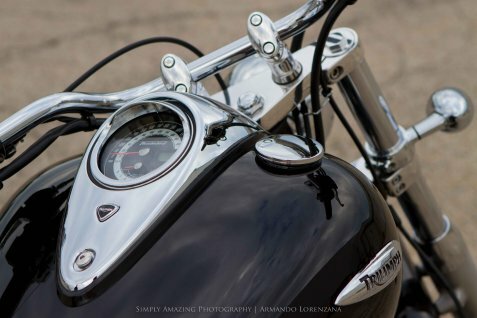 The Thunderbird also comes equipped with a digital readout of fuel, a tachometer, and a digital display of other parameters on the bike all in a single cluster. ABS is also standard, and Triumph has a bevy of options available to build the bike to your tastes. With all this in mind, the Thunderbird is a good value compared to other cruisers at $13,499. Where other bikes are fine with a “me too” approach to cruisers, Triumph brings a unique offering with its own history. It’s the original Wild One, and to overlook Triumph’s mid-tier cruiser offering would be a mistake.